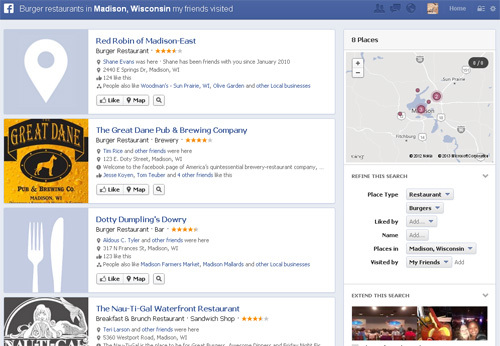 In January, Facebook started a limited release of it’s new search engine, the Graph Search. Even though Graph Search is still in beta and working out the kinks, it’s a major improvement on the existing search engine within Facebook, and I believe it will be setting the standard for social search in the future. Depending on how you put together your search phrases, you can get super narrow results if you’re looking for something specific, or a wider range of results if you want to explore a bit more. Let’s look at some examples! 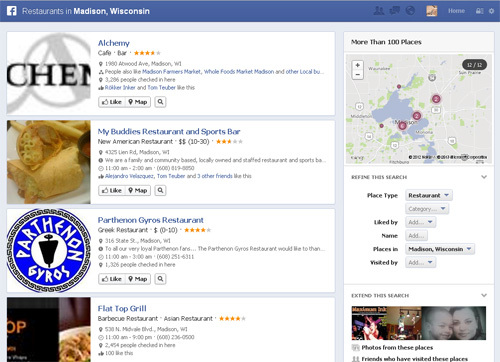 Say I wanted to find a place to eat here in Madison, I could enter a really basic phrase “Restaurants in Madison, WI”. This will bring up a pretty big list of restaurants, each displaying the kind of restaurant it is, as well as its location, phone number, hours, price range, number of check-ins, and will even show if you have friends that like the page. You can refine this search by selecting different options in the right hand sidebar, or you can enter in a more specific search phrase. For example, if I knew I wanted to get a good burger in town, but wanted one my friends approve of, I could search for “Burger Restaurants in Madison, WI my friends have been too.” This will give me a much more tailored result, including which of my friends visited each restaurant. Of course, Graph Search can go way beyond just finding a place to eat. It allows you to see connections between friends and people that you might not have before. You can find a common interest between someone and yourself by searching “Pages that (Friend’s Name) and I like”, or find people you might know in your area by searching “Friends of my friends that live in (City)”. Even with all of the parameters available to search, there are still things that can’t be run through Graph Search yet. Individual posts can’t be searched at the moment, so phrases like “Posts by my friends about (a subject)” aren’t an option yet, and neither are searches with “not”, for example “My friends who do not like (a Page)”. I expect these two, and many other options, to be worked in as Facebook continues to tweak Graph Search.